Inspired by the attempted-but-failed dismemberment of Peruvian rebel leader Tupac Amaru II by Spanish colonial authorities, and is a lengthy, groovy, and vicious representation of that feeling. We went off the deep end and into some murky waters for this split EP with Kalte Sonne, and we couldn’t be happier with the result!! Alpaca is a sludge doom metal band from Shanghai who formed in late 2015. Composed of four individuals from different countries, they have become a prominent figure to emerge from the Shanghai underground music scene. Alpaca have noted Down, Eyehategod, Crowbar, Corrosion of Conformity, Red Fang, Mastodon, and Melvins as key influences to their sound. Alpaca’s riffs feature layers of feedback and down-tuned guitar and bass tones that are drowned in dark Southern blues. 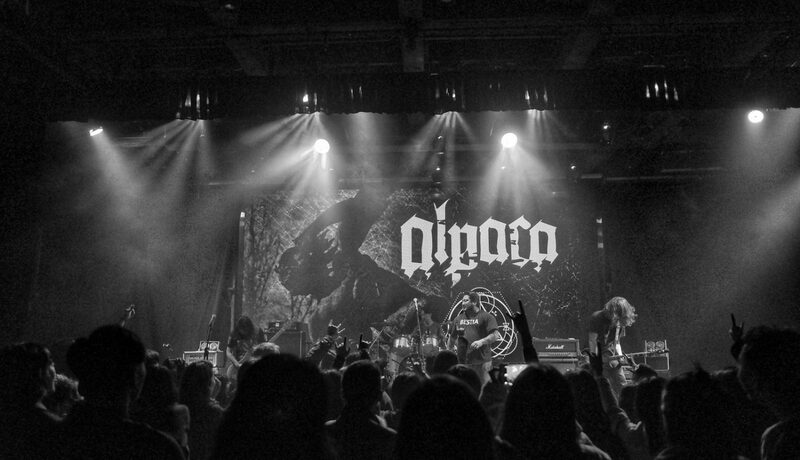 Combined with deep semi-melodic growling vocals that occasionally even reach black-metal styled pitches, the outcome is a gravely, rasping, and savage sound. They have played with some the best bands China’s underground scene has to offer, playing in various cities around the country, and played a six-show tour in Japan in late 2017. They have also organized and performed in their annual SHANGHELLFEST, the bi-monthly SHANGHORRORFEST, and the 2017 charity event, SHANGHEARTFEST.